It's kind of overcast and a bit chilly here today, so I am taking it easy this Sunday on my comfy baby blanket! To tell you the truth, a former co-worker of Momma's made it for her and Daddy's first grandson Tyler, but since he is in St. Louis and I am here at the Lake, Momma decided that it should be mine and only mine; someone may as well enjoy it ... hee hee! Wow, you are one lucky kitty to have that nice cozy blanket. We are very jealous. Hope you have a super Sunday. It's nice and sunny warm here today! 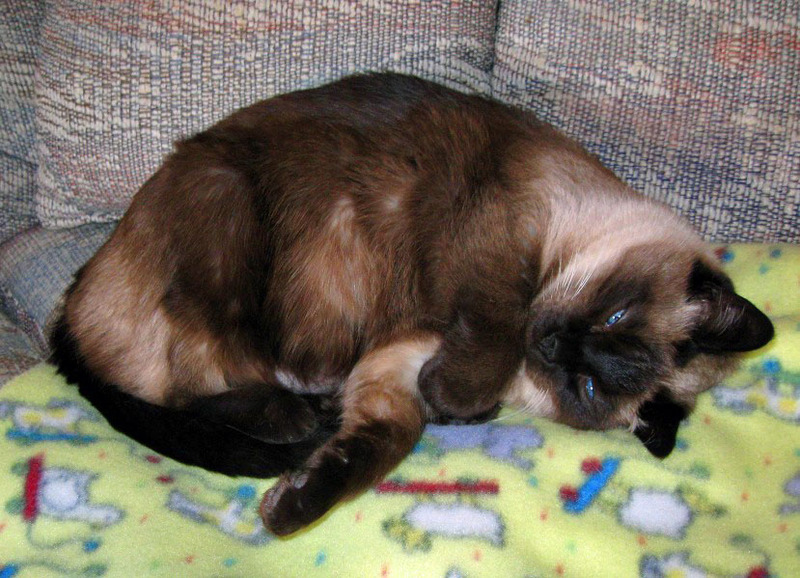 That's a very nice baby, we mean meezer mancat, blanket, Sam. Well I am glad you like your blanket, even if it is a hand-me-down... :)! Our neighbor chihuahua dog Treble was here visiting and he layed on MY blanket, but Momma told Daddy to make him get off of it! That is just SOOO wrong ... the nerve of him! At the Lake !!!! I think after good nap, You should go to check there..May be you can get the big fish, Sam !!! Mr. Puddy, us meezers are inside only meezers, so no fishies in our future unless Daddy gives us one that he catches ... hee hee! That looks like a very comfy blankie, Sam!! Enjoy your nap and your Sunday!! That blankie looks very soft. We hope you had a good Sunday.